Club Penguin times | Thunderman87's Club Penguin Cheats,Gltches,Secrets & More! Awsome! There has been alot happening at the mine and Rory asks us to go help him out! We’ll here are the upcoming events! 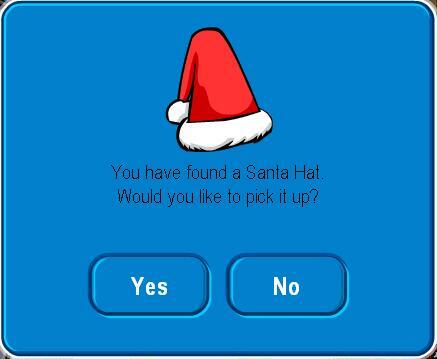 Club Penguin Christmas Party 2009 Guide! 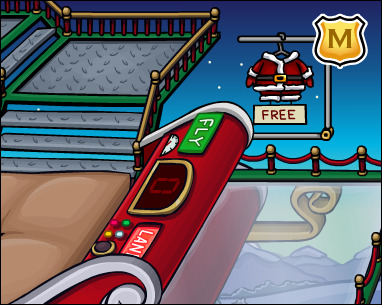 Hey CP, the christmas party is here and i am going to show you the free items and how to play the Santa Sled Ride! Ok first hee is the Non-members free item! 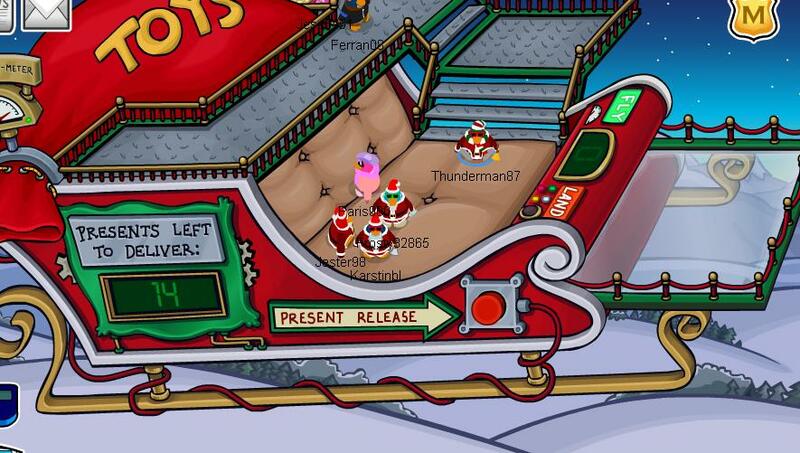 Once your in you willl be on a GIANT SLEIGH! Ok the whole point is to press the button to release presents! 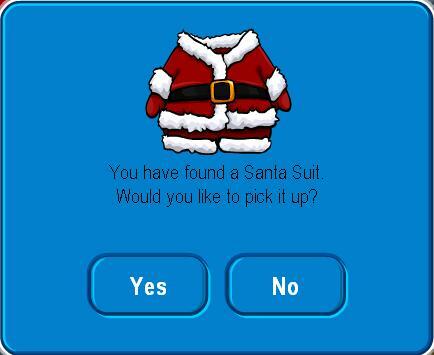 Once you have released 15 presents into chimnys you get the santa suit! Here is what it looks like when you get it! Credit to jmann93 for that pic! Hey CP, here is this weeks reviewed by you! Last weeks question was how will you be decorating your igloo for the season? When it comes to decorating I get creative!! Some tips that i can give you is that do something different than everybody else. Instead of buying the Snow Globe igloo like all of your friends you could buy the Restaurant Igloo and decorate it with holiday themed items and serve some hot chocolate!!! Also put some up-beat music and dance! What makes your igloo unique is that you decorate it with your style, not like everybody else’s! Enjoy decorating and happy holidays!!!!! Write your Reviewed By You answer as a comment on the Club Penguin Blog! They’ll post one (50 – 75 words please) in next week’s Reviewed By You. And if your comment is chosen as the feature comment on next week’s blog, they’ll add 10,000 coins to your penguin account. Don’t forget to use your penguin name so they can add coins! PS: Here are my 10,000 hits party information! The party is tonight! Please come I would be nothing without all of you! Thunderman87’s 10,000 hits party is today! Click the banner below for the invitation! Awsome hereare the upcoming events! 😀 LoL Hope you guys can come to my party! Enjoy the Newspaper! 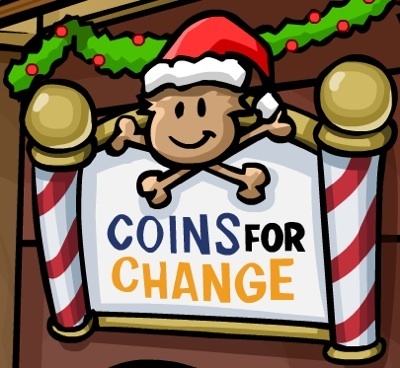 I am going to get the Coins for Change Igloo Item and pop it in my igloo. Then, I will host a contest with my friends, and we will see who can donate the most coins! Fun to earn, and fun to give! I will run around Club Penguin, ringing my bell, wearing my scarf and treasured green turtleneck! To top it off, I will find Rockhopper, I will do a jolly dance with him! 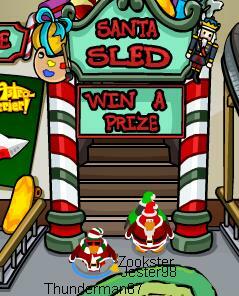 This weeks Question is: how will you be decorating your igloo for the season? If you don’t know where to enter leave a comment here! Write your Reviewed By You answer as a comment on the Club Penguin Blog! They will post one (50 – 75 words please) in next week’s Reviewed By You. And if your comment is chosen as the feature comment on next week’s blog, they will add 10,000 coins to your penguin account. Don’t forget to use your penguin name so they can add coins!